The rufous-necked hornbill (Aceros nipalensis) belongs to the family Bucerotidae under the order Bucerotiformes. The name Aceros means without horn or hornless. The species Aceros nipalensis lack obvious casque (horn-like structure). However the other three species under the genus Aceros, Aceros corrugatus, Aceros leucocephalus and Aceros waldeni have casques. The family Bucerotidae includes 62 species. The species under family Bucerotidae are characterized by a heavy, long, down-curved bill, which is frequently brightly colored. Many species have a casque, a hollow structure, running along the upper mandible. The species under the family Bucerotidae have two-lobed kidney. The heavy bill is supported by strong neck muscles and neck vertebrae. The neck vertebrae, atlas and axis, are fused together, providing a stable base for carrying the heavy bill. Current topic in Birds of India: Rufous-necked hornbill (Aceros nipalensis) photos. The rufous-necked hornbill (Aceros nipalensis) is a very large hornbill belonging to the family Bucerotidae. 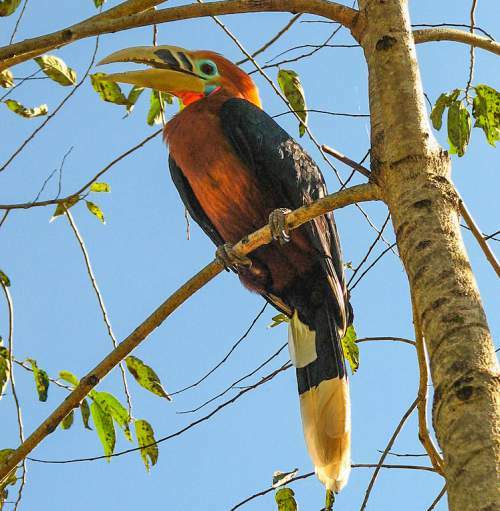 The rufous-necked hornbill species are distributed in India, Nepal, Bhutan, China, Myanmar, Laos, Thailand and Vietnam. These hornbill species are listed as "Vulnerable" by the IUCN. These hornbills are monotypic species. The rufous-necked hornbill (Aceros nipalensis) is closely related to Wrinkled hornbill (Aceros corrugatus), Writhed hornbill (Aceros leucocephalus) and Walden's hornbill (Aceros waldeni). The rufous-necked hornbill (Aceros nipalensis) is a very large hornbill, measuring 90 to 100 cm in length. The male rufous-necked hornbill is slightly larger and weighs 2500 grams whereas the female weighs around 2200 grams. These species are sexually dimorphic, the male has reddish brown head, neck and underparts. 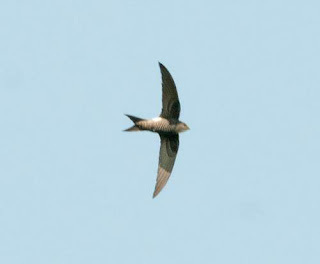 The upperparts in male are black and the black wing has white-tipped outer primaries. The female rufous-necked hornbill has black head, neck and underparts. The juveniles have plumage similar to males but their bills lack dark ridges. The tail in adult is long and the basal half is black and the distal half is white. 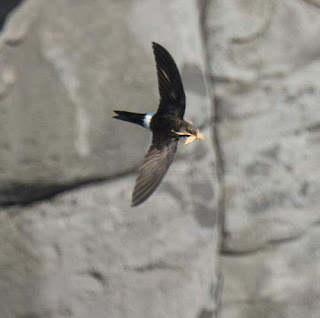 The bill is pale yellow in adult and has a row of vertical dark ridges on the upper mandible. The casque is almost absent. There is red gular skin. The irises are brownish red and orbital skin is pale blue. Their call is a loud barking "kok..kok" sound. 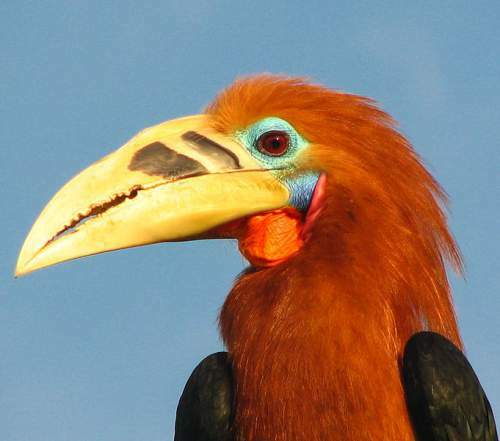 The rufous-necked hornbill species are distributed in India, Nepal, Bhutan, China (southern Yunnan and south-east Tibet), Myanmar, Laos, Thailand and Vietnam. It is probably extinct in Nepal and almost extinct in Vietnam. In India, these rufous-necked hornbill species are distributed in the states of northern West Bengal, Assam, Arunachal Pradesh, Meghalaya, Nagaland, Manipur and Mizoram. 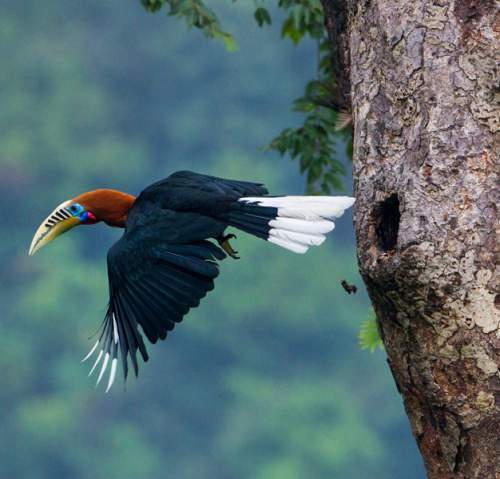 The Important Bird and Biodiversity Areas (IBA) of the rufous-necked hornbill species in China are Yarlung Zangbo Daxiagu Nature Reserve, Xishuangbanna, Nabanhe Nature Reserve and Lhakhang. The IBA in Vietnam are Pu Mat and Che Tao. 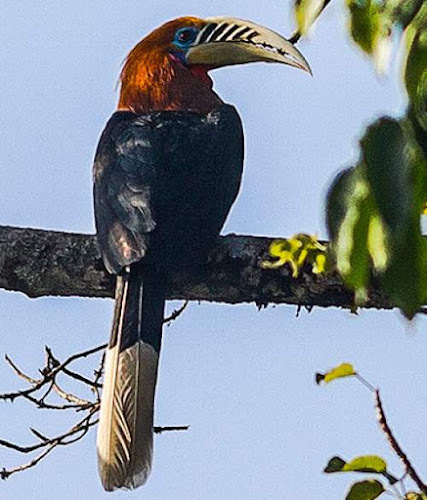 The IBA of the rufous-necked hornbill species in Bhutan are Toorsa Strict Nature Reserve, Thrumsing La National Park, Sarpang-Gelephu foothills, Samtse, Royal Manas National Park, Phipsoo Wildlife Sanctuary, Kori La, Neoli Wildlife Sanctuary, Kamji, Jigme Singye Wangchuk National Park and Samdrup Jongkhar. Some of the IBA of these hornbill species in India are Namdapha National Park, Papum Reserve Forest, Pakke Tiger Reserve, Nameri National Park, Manas National Park, Sonai-Rupai Wildlife Sanctuary, Buxa Tiger Reserve, Mount Zanibu, Mahananda Wildlife Sanctuary and Magu Thingbu. The IBA of the rufous-necked hornbill species in Myanmar are Hkakaborazi, Ngwe Taung, Hponkanrazi, Nat-yekan, Hukaung Valley and Kyauk Pan Taung. The IBA in Thailand are Huai Kha Khaeng, Umphang, Thung Yai - Naresuan and Mae Wong. 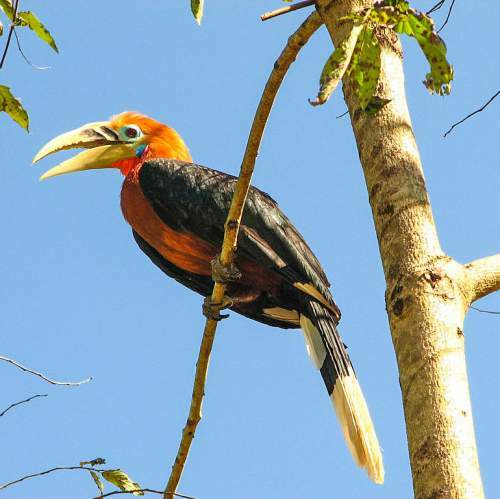 These rufous-necked hornbill species have high forest dependency. These species occur in altitudes from 150 to 2200 meters. 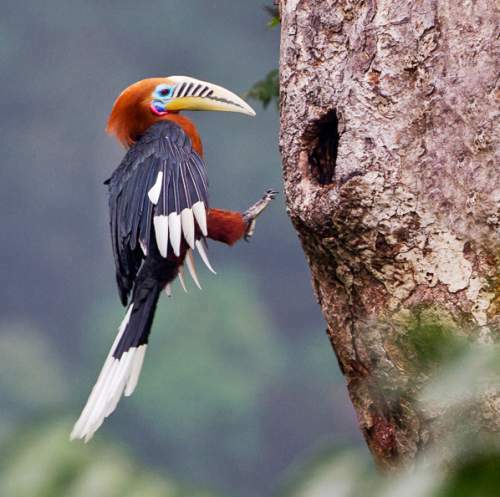 The natural ecosystems of these hornbill species include tropical and subtropical moist montane forests, tropical and subtropical moist lowland forests, dense evergreen forests, broadleaved forests, deciduous foothill forests and dry woodlands. The diet of these rufous-necked hornbill species is mostly fruits. Berries, drupes, fruits of Lauraceae spp., Moraceae spp., Meliaceae spp. and Annonaceae spp. are their primary food. 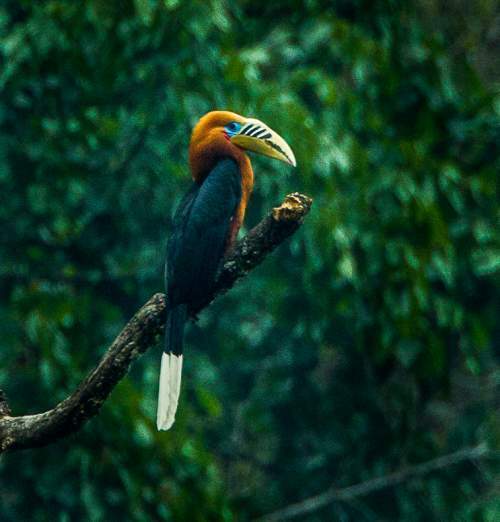 The breeding season of these rufous-necked hornbill species in northeast India is from March to June. 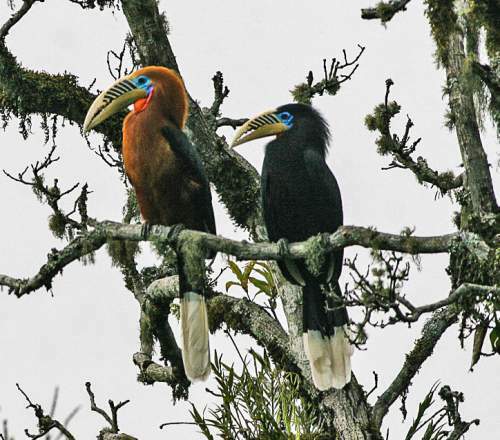 These hornbills are monogamous species. They nest in natural holes and hollows in old, tall, wide-girthed trees. 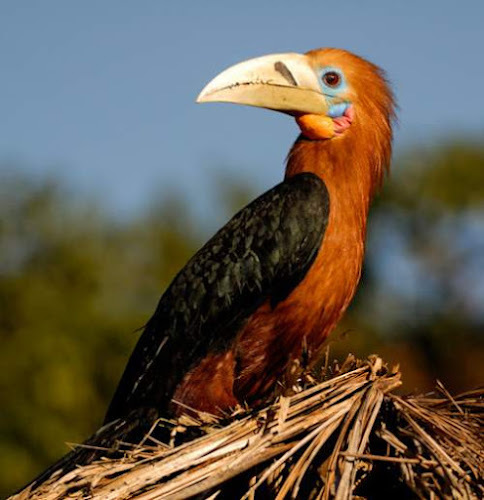 The rufous-necked hornbill pair may use the same nesting site in consecutive breeding seasons. After entering the hollow, the female seals the hole with its droppings, mud and fruit pulp. 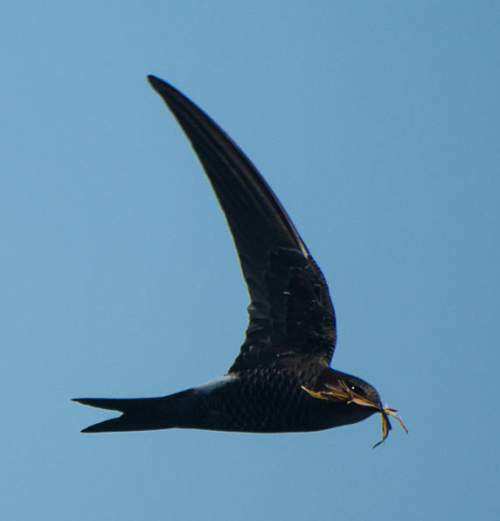 A small aperture is left for the male to transfer food to the mother and the chicks. The typical clutch contains one or two pale white eggs. These rufous-necked hornbill species are non-migratory resident birds. Movements to lower altitudes during winter had been reported. The global population size of the rufous-necked hornbill (Aceros nipalensis) is estimated to be around 1500 to 7000 individual birds. 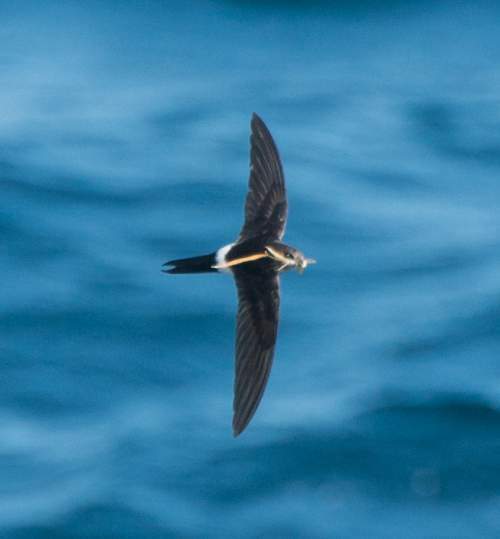 The overall population trend of these species is considered to be decreasing. Throughout its range it is reported to be very rare. The generation length is 19 years. Their distribution size is about 1,300,000 sq.km. The rufous-necked hornbill (Aceros nipalensis) has approached the thresholds for being Vulnerable, under the range size criterion, under the population trend criterion and also under the population size criterion. The cutting of old fruiting and nesting trees, deforestation, habitat fragmentation, hunting and trapping for pet trade are the main threats that may endanger the survival of these hornbill species. The IUCN (International Union for Conservation of Nature) has categorized and evaluated the species and has listed it as "Vulnerable". 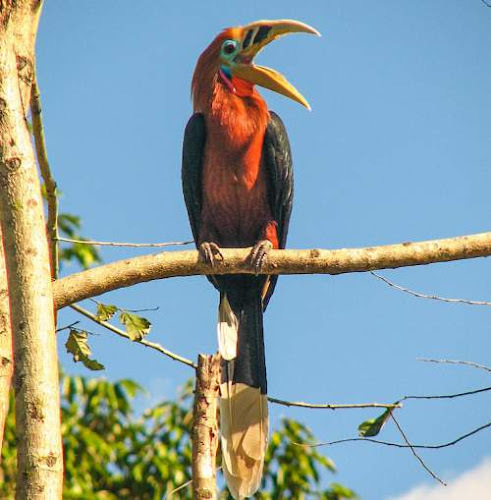 The CITES (Convention on International Trade in Endangered Species of Wild Fauna and Flora) status is ‘Evaluated’ for the rufous-necked hornbill (Aceros nipalensis) and listed in Appendix II. Current topic in Birds of India: Rufous-necked hornbill - Aceros nipalensis. The collared kingfisher (Todiramphus chloris) is a tree kingfisher belonging to the family Alcedinidae. 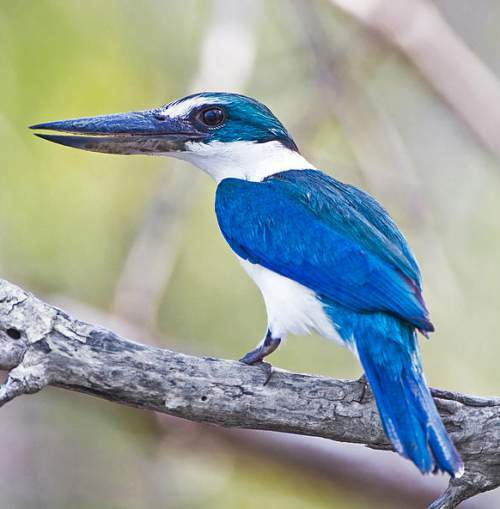 The collared kingfisher species are distributed in India, Red Sea region, Persian Gulf area, Bangladesh, southeast Asia, several Pacific islands and Australia. There are fifty recognized subspecies of these kingfishers. 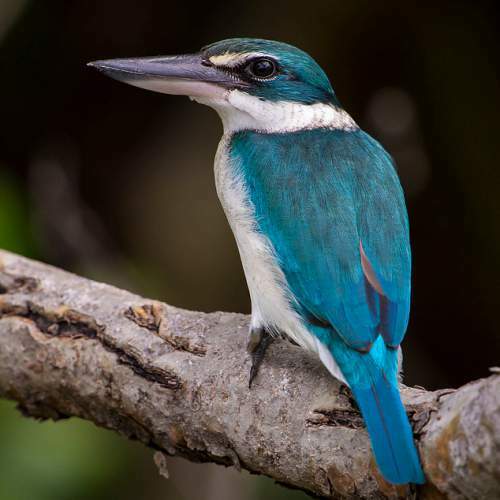 Some of the subspecies of these kingfishers (T. c. kalbaensis) are endangered. The collared kingfisher (Todiramphus chloris) is a medium-sized kingfisher, measuring 20 to 25 cm in length. The female collared kingfisher is slightly larger and weighs 55 to 100 grams. The male weighs 50 to 90 grams. The plumage pattern is variable among the subspecies. 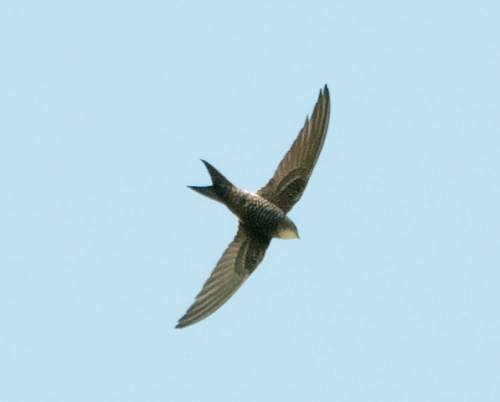 The upperparts are blue or bluish green and the underparts are white or pale yellowish brown. There is a white collar around the neck; hence the name. In some collared kingfisher subspecies there is a white stripe over the eye. Some subspecies have a white spot between the eye and the bill. The broad, large bill is black with pale yellow or white patch at the base of the lower mandible. The irises are dark brown. A black stripe may pass through the eyes. The legs are gray. The female collared kingfisher tends to be greener than the male. Their call is a variety of loud, harsh and metallic “kee-kee-kee-kee” sounds. 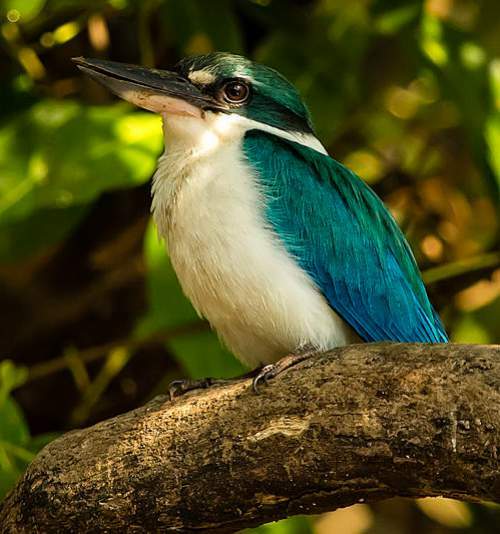 The collared kingfisher species are distributed in Eritrea, Djibouti, Ethiopia, Saudi Arabia, Oman, United Arab Emirates, India, Bangladesh, Myanmar, Thailand, Cambodia, Laos, Vietnam, Malaysia, Singapore, Brunei, Indonesia, Philippines, Australia, Timor-Leste, Papua New Guinea, Vanuatu, Solomon Islands, Northern Mariana Islands, Micronesia, Fiji and American Samoa. In India, the collared kingfisher species are distributed in the states of Mizoram, West Bengal, Maharashtra, Goa, Karnataka, Andaman Islands and nicobar Islands. The Important Bird and Biodiversity Areas (IBA) of collared kingfisher species in Oman are Khor Kalba, Khawr Shinas and Khawr Liwa. The IBA of these species in Saudi Arabia are Khawr 'Amiq, Qishran Bay and Shuqaiq mangrove. The IBA of these collared kingfisher species in United Arab Emirates is Khor Kalba. These collared kingfisher species have moderate forest dependency. These species occur in altitudes from 0 to 1500 meters. The artificial ecosystems of these kingfishers include urban areas, cultivated lands, plantations and rural gardens. 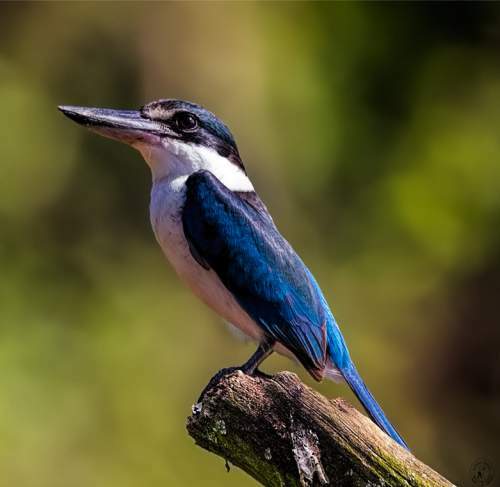 The natural ecosystems of these collared kingfisher species include tropical and subtropical dry forests, tropical and subtropical moist lowland forests, tropical and subtropical shrublands, dry savanna and tropical and subtropical dry grasslands. The natural wetland ecosystems include tropical and subtropical mangrove vegetation, marine intertidal mud flats, estuaries, marshes, peatlands, rivers, streams and creeks. The diet of these collared kingfisher species is mostly crabs. Small fish, shrimp, crabs, insects, worms, snails, frogs, lizards and small birds are their primary food. These kingfisher species use open perch for hunting prey. On spotting a prey, it swoops down and catches the prey with bill. The prey is taken to the perch and battered to break carapace and kill it, before swallowing. 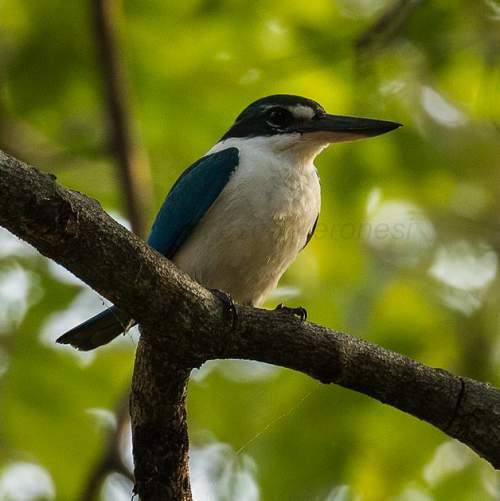 The breeding season of these collared kingfisher species in Bangladesh and northeast India is from March to August with a peak period in April and May. The breeding season of these kingfisher species is from April to July in Ethiopia. In United Arab Emirates the laying season is in June. 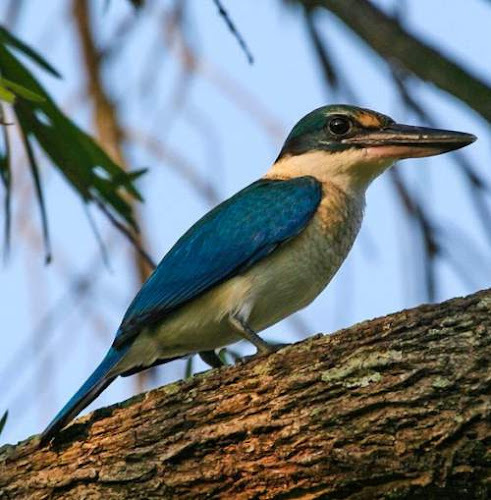 These collared kingfisher species nest in burrows, excavated in rotten trees, termite mounds or earth bank. The tunnel ends in a broader nesting chamber. They may make use of abandoned woodpecker holes. They lay eggs on the bare ground of the burrow without any lining. The typical collared kingfisher clutch contains two to seven round, white eggs. Both the parents incubate the eggs. The hatchlings are initially blind and lack down feathers. The chicks fledge in about 44 days. 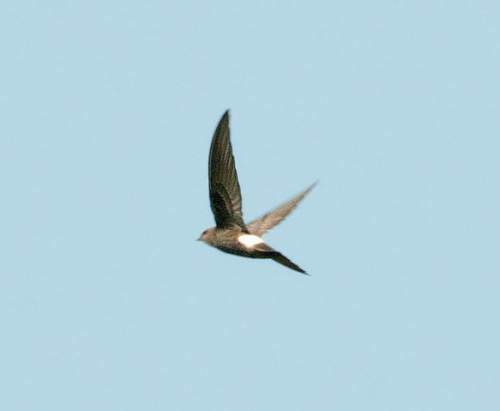 The pair may raise two broods in a year. These collared kingfisher species are non-migratory resident birds. Post breeding, the juveniles may disperse and establish in new locations within the range. They may make local movements for feeding and breeding within their range. The global population size of the collared kingfisher (Todiramphus chloris) has not been quantified. The overall population trend of these species is considered to be decreasing. Throughout its range it is reported to be very widespread and common to abundant. The generation length is 4.8 years. Their distribution size is about 55,200,000 sq.km. 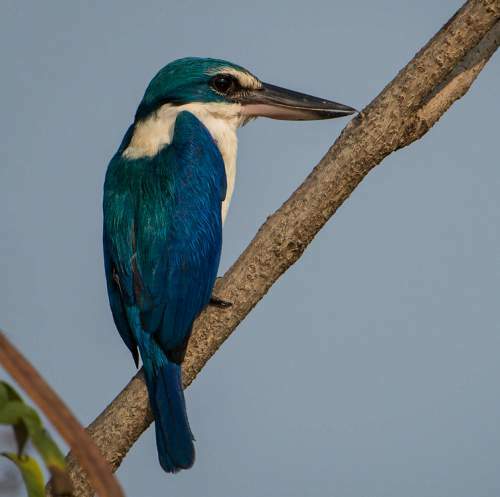 The collared kingfisher (Todiramphus chloris) does not approach the thresholds for being Vulnerable, either under the range size criterion, or under the population trend criterion or under the population size criterion. The destruction of mangrove forests and trapping for pet trade are the main threats that may endanger the survival of these species. 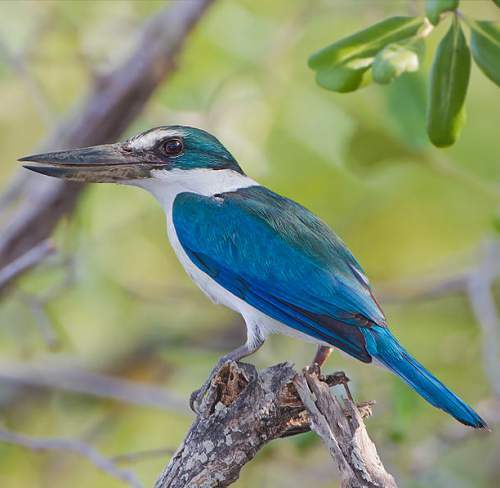 The IUCN (International Union for Conservation of Nature) has categorized and evaluated the kingfisher species and has listed it as of "Least Concern". 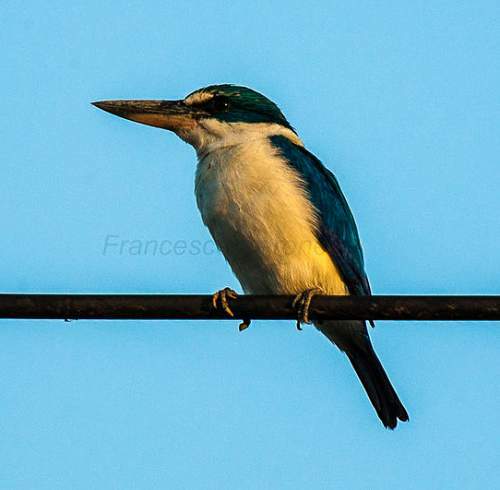 The CITES (Convention on International Trade in Endangered Species of Wild Fauna and Flora) status is ‘Not Evaluated’ for the collared kingfisher (Todiramphus chloris). 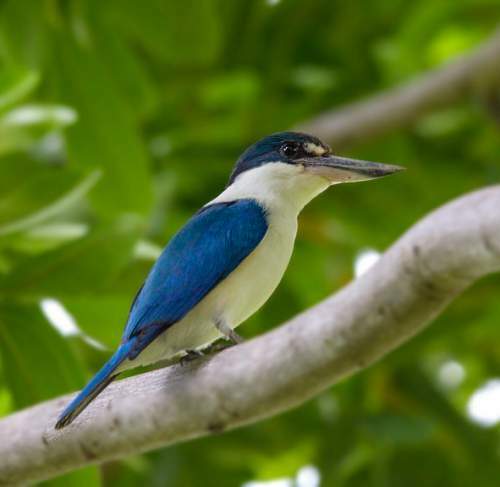 The collared kingfisher (Todiramphus chloris) is closely related to the Talaud kingfisher (Todiramphus enigma), Guam kingfisher (Todiramphus cinnamominus), sacred kingfisher (Todiramphus sanctus) and chattering kingfisher (Todiramphus tutus). Some of the subspecies of Todiramphus chloris are: T. c. chloris, T. c. collaris, T. c. palmeri, T. c. azelus, T. c. chloropterus, T. c. laubmannianus, T. c. armstrongi, T. c. humii, T. c. occipitalis, T. c. davisoni, T. c. vidali, T. c. kalbaensis, T. c. abyssinicus, T. c. sordidus, T. c. pilbara, T. c. colcloughi, T. c. teraokai, T. c. owstoni, T. c. albicilla, T. c. orii, T. c. matthiae, T. c. nusae and T. c. novaehiberniae. Current topic in Birds of India: Collared kingfisher - Todiramphus chloris.